Windows insider team is working on Windows 10 Redstone 2 PC build 14957 and mobile build 10.0.14957.1000. 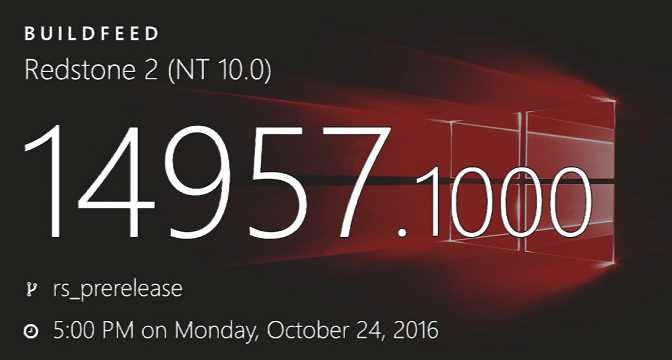 The internal build 14957.1000 is compiled on October 24, 2016. The cumulative update build 10586.639(Threshold 2), and build 10240.17157(Threshold) is also under testing. Microsoft is looking forward to Windows 10 build 14955(most probably) as next insiders build this week. The screenshots of the build 14955 already leaked online. Microsoft is also holding an event tomorrow, where it may announce new Surface Studio AIO PC.